At the inaugural Northeast Ohio Parent Education Expo — which will take place Sunday, September 23 from 10 a.m. to ​2​ p.m. at the Nautica Entertainment Complex on the West Bank of the Flats in Cleveland — attendees will be able to hear and learn from dozens of area schools offering a wide variety of options for public and private school education. Size. Location. Cost. Academic approach. All of these are factors that come into play when a family is seeking a new school for their child. However, there’s much more to consider when assessing educational options — and it doesn’t need to be stress-inducing! Join a former independent school admission director to discuss the key elements families should consider when evaluating schools, as well as the questions you should be asking along the way. Whether you have a child starting college in 18 years or in 2019, Ohio’s 529 Plan can help you save for educational expenses. Learn more about Ohio’s 529 Plan, CollegeAdvantage, and start your college savings today. How do children develop the cognitive capacity to make responsible decisions, and how can parents and educators support this process? This session on fostering independent decision making in children and teens will explore how parents around the world teach self-reliance. We also will look at the stages of moral development to gain an understanding of how children grapple with complex decisions as they mature. 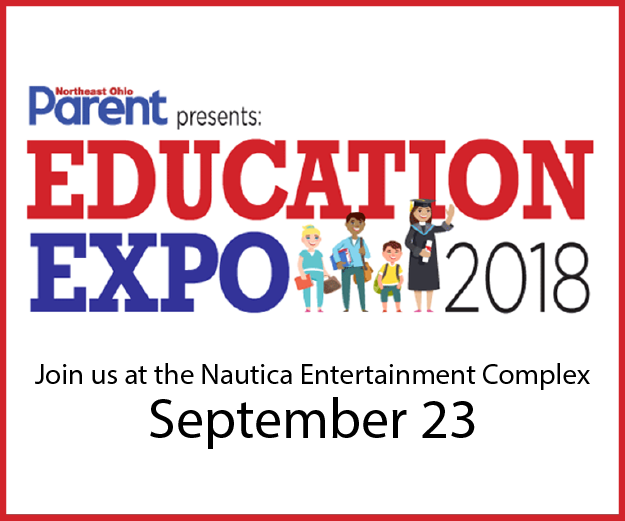 The free Education Expo is brought to you by Northeast Ohio Parent in partnership with Nautica E​ntertainment C​omplex, the Greater Cleveland Aquarium and the Nautica Q​ueen. The event also will include ​activities, raffle giveaways, and crafts to provide a full day of fun. Families can take advantage of the location with event day discounted admission ​to the Greater Cleveland Aquarium and the Nautica Queen. Registered attendees will be entered into a drawing for an annual family pass to the Greater Cleveland Aquarium, as well as a raffle for a 4-pack of tickets to Cedar Point. Pre-registration also earns visitors a $3 parking voucher; BOGO admission to the aquarium (one free child per paying adult, good through September 30 — a $13.95 savings); a discounted pass for a sightseeing cruise on the Nautica Queen; a discount on food at the Nautica Café the day of the event; it also qualifies participants to receive a free tote bag if they are among the first 250 families to arrive. Sponsorship opportunities and exhibitors tables are available for area schools or businesses closely tied to education. If interested, contact Northeast Ohio Parent at [email protected] or 330-822-4011.